People are being urged to get behind the Charnwood Community Lottery in 2019 and support local causes in the borough. Over 10,000 lottery tickets have been sold and around £6,000 has already been raised for good causes since Charnwood Borough Council launched the lottery in September 2018. Cllr Deborah Taylor, the Council’s lead member for communities said: “It’s great that £6,000 has already been raised for a number of causes which do amazing work to help residents in our borough. For every £1 ticket purchased, 60p goes towards helping good causes in the borough and people are able to choose which good cause to support when buying their ticket. Falcon Support Services is one of the good causes which benefits from the money raised from the lottery. The charity helps those that are homeless or vulnerable in the community and has already received over £250 from the lottery. 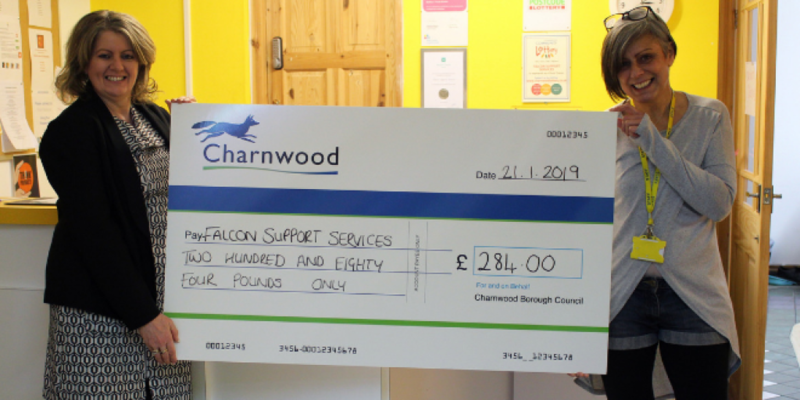 Rachel Hall from Falcon Support Services said “The Charnwood Community Lottery offers an extra bit of regular funding to help us plan and deliver our services. “There’s no additional cost to us and so far we’ve been able to use the money from the lottery to provide vital services to rough sleepers such as food, clothes, showers, support and housing. A number of people have already won prizes of £250 and £25 or three extra tickets. Charnwood Community Lottery helps raise money for good causes, charities and voluntary organisations. Local causes are still able to register for the lottery by visiting www.charnwoodlottery.co.uk. For every £1 ticket sold, 60p goes towards helping good causes and players can win up to £25,000. People can choose to support a good cause which has signed up to be involved or for their donation to go into the general pot which the Council will use for community grants.